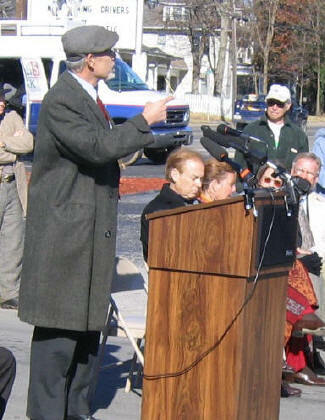 At 10:30 Wednesday morning, November 30, 2005, Franklin Mayor Tom Miller hosted a special event to demolish the Pizza Hut on Columbia Avenue in Franklin near the Carter House. The City had recently purchased the corner lot for $300,000 which is near the main Federal trench line and near the place where Patrick Cleburne fell during the 1864 battle. A large and jubilant crowd estimated at 200 heard comments by Mayor Miller, National Park Service Historian Emeritus Ed Bearss, Carter House Executive Director Thomas Cartwright, Congressman Lincoln Davis, and CWPT President Jim Lighthizer before the demolition began. The crowd included representatives from the state legislature, the Tennessee Historic Commission, and all of the state and local preservation groups - and STFB members Nell Harvey of Sacramento, CA and Betty Stephens of Pryor, OK who had made a special effort to be in Franklin for this event. We had notes beforehand from STFB members in Illinois, Alabama, and Indiana who planned to be here as well but in the rush and clamor we didn't get to meet them. 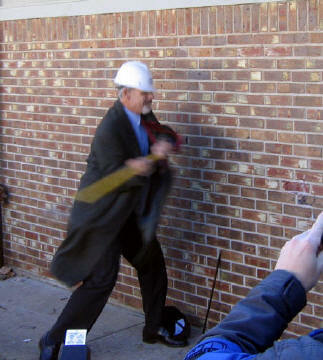 The morning was crisp and sunny, not unlike the day of the battle 141 years ago, as Mayor Miller hefted the 10 pound sledgehammer to strike the brick veneer. After he and others took their symbolic turns, without notable effect, Thomas Cartwright stepped forward. With a powerful John-Henry-like stroke witnessed by the cheering crowd, Thomas smote the brick wall a mighty blow sufficient to punch a hole completely through it. More loud cheers and applause. Thomas was not the only attendee with misty eyes. Mayor Miller then climbed into the drivers seat of a tracked backhoe-like machine and made several destructive swipes that began the actual demolition of the building. By sunset, the building was essentially down and removed. On November 22, Franklins Charge officers signed the financing contracts with our sponsoring banks for the 112 acre golf course purchase as a City Park. The National Parks Service and the Civil War Preservation Trust each provided $500,000 as part of the $2.5 million match to the City's $2.5 million. The bank loan covers the donor pledges that Franklins Charge will receive as donations in future years.